Definition: A payroll journal entry is a method of accrual accounting, in which a business records its debit and credit payroll transactions pertaining to employee compensation. 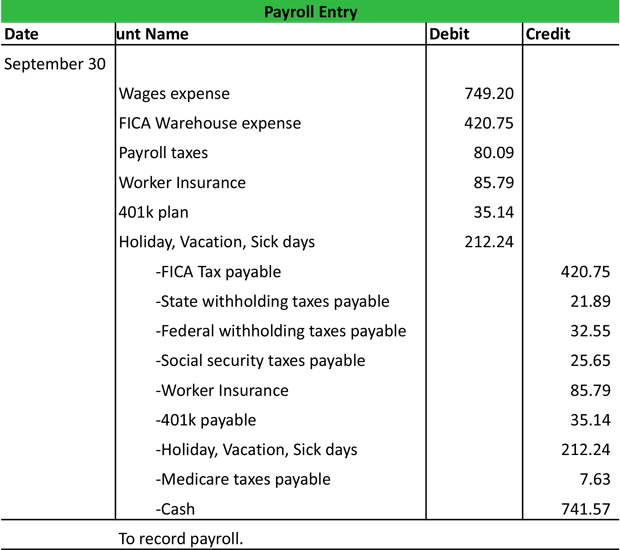 A payroll journal entry includes employee wages, direct labor expenses, FICA expenses, payroll taxes, and holiday, vacation and sick days in the Debit section. Other items may be specialized payroll options, such as a 401k plan. The Credit section includes FICA taxes, state withholding taxes, federal withholding taxes, social security taxes, and Medicare taxes. Other items may be federal unemployment taxes and state unemployment taxes. The two sections should be of an equal amount. On Sep 30, the wages are $749.20 for each warehouse worker ($93.65 per hour x 8 hours). Based on the government payroll guidelines, FICA taxes are $420.75, payroll taxes are $80.09, and worker insurance is $85.79. 401k plan contributions $35.14 and holiday, vacation, and sick days, $212.24 are based on agreements with employees. The Debit section totals $1,583.21. The credit section includes the employer’s share of FICA $420.75, state taxes $21.89, federal taxes $32.55, social security taxes $25.65, and worker insurance $85.79, which all abide by the government tax guidelines. Credits also include the company contributions for the 401k plan $35.14, holiday, vacation, and sick days $212.24, and Medicare expenses of $7.63. The credit section totals $861.64. Note that the total amount of state taxes $21.89, federal taxes $32.55, and social security taxes $25.65 equals the payroll taxes of $80.09. in the Debit section. The difference between the Debit section and the Credit section is the cash amount paid to the warehouse worker. In this case, $1,583.21 – $841.64 = $741.57. It is also the amount the company’s cash will decrease by.